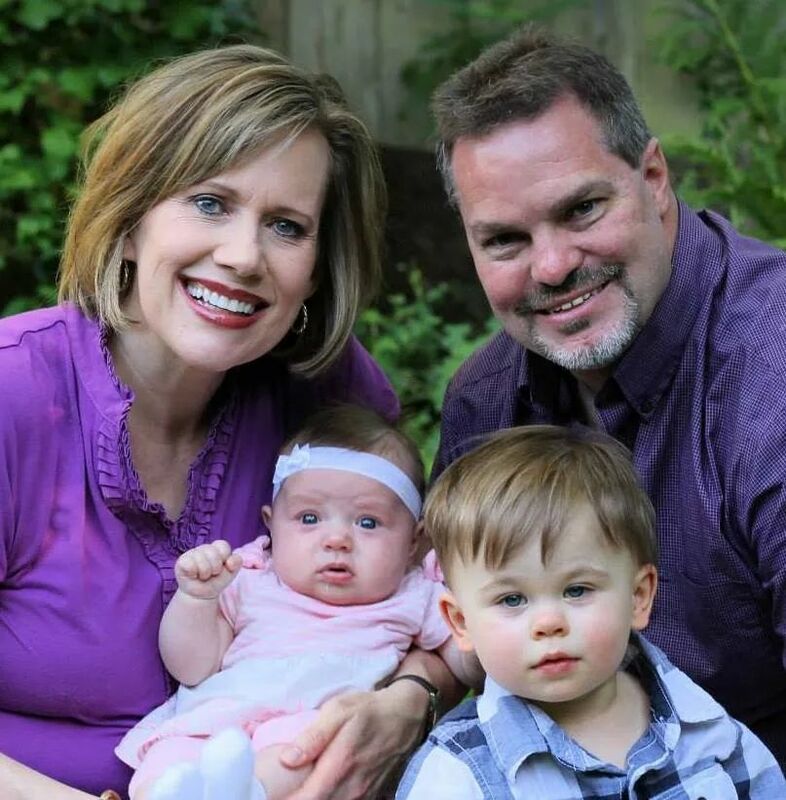 We continue our exclusive embryo adoption interview series by talking with Kelli Gassman, who adopted the embryos of Chris and Rebecca Henderson. Kelli shares with us her and her husband’s journey to become parents and the unique relationship they have with the Hendersons today. 4word: What was your time as a single professional woman like? Kelli: I have been blessed with an amazing 25+ year career that has taken me to far-flung places of the world with travels to more than 24 countries. Before marrying my husband, I worked on marketing and branding projects for FedEx as part of their global business development division. I enjoyed the international travel, cultural experiences, and collaboration with colleagues around the globe, but my heart yearned to find the right guy and have a family. 4word: How did you and your husband meet? Kelli: After many years of waiting on God’s best in a marriage partner, my husband Dan and I met on a Christian single’s dating website in our early 40’s. Originally, I signed up for the website thinking I would meet some nice people, but never expected to find the man I would marry from a picture and a four-sentence profile. From that initial “halo” (the dating site’s equivalent to a “wink”) to emails and long phone calls, along with cross-country visits back and forth, I knew quite quickly Dan was the man God had intended for me. After a whirlwind courtship and a romantic beach proposal, we married one year to the day after Dan sent me that first “halo” at ages 41 and 42. 4word: Tell us about the unique journey you and your husband went on to starting your family. Kelli: While having married later, Dan and I hoped God would bless us with a family. We started trying to have a baby about a year after we were married in 2008, but after eighteen months of nothing, I sought help from a reproductive endocrinologist (RE) in January 2011. After six months of blood tests, scans, and other assessments, each coming back with more negative results, our hearts ached at the loss of the dream of becoming parents, which seemed to be ebbing away before us. We began to seek God’s specific direction at this very uncertain juncture. In God’s divine timing, the day before we were set to receive the final diagnostic findings from the RE in June 2011, I visited my family physician for a routine checkup. As I recounted the previous six months of testing through a flood of tears, she said, “Have you considered embryo adoption?” I asked, “What’s that?” while trying to compose myself. As she explained the process of how we could receive donated embryos from another family which could allow me to experience pregnancy and give birth to my adopted child, my heart brimmed with excitement. Immediately, I went home and shared this information with Dan. We spent four hours researching all of the different aspects of embryo adoption: where we could adopt, the process, costs, etc. In very short order, God melded our hearts that this was the direction that we had been seeking. Armed with a list of embryo adoption questions, we met with our RE the next day. He presented us with some earth-shattering news: my eggs were no longer viable. Already resolved on our next step, I began the next week to contact embryo adoption programs we had found during our research. The first one I called completely shut me down in the first two minutes of conversation by asking me my age. When I responded with “45,” they told me they couldn’t help me. Without being deterred, I immediately called the next agency on our list, the Snowflakes Embryo Adoption Program (Snowflakes) through Nightlight Christian Adoptions. My first question was: did they have an age restriction? The woman on the other end of the phone said, “No, as long are your doctor deems you healthy and able to carry a pregnancy.” With that, I broke down into a heaving, sobbing mess, as the woman patiently waited for me to collect myself. This was the culmination of so many months of grief, and now relief with a tangible solution before us. After discussing more details, we set up a face-to-face meeting in the Snowflakes office in Southern California for two weeks later. In October 2011, Snowflakes matched us with another family, based on mutually compatible criteria. We were so excited to receive the donor profile of Chris and Rebecca Henderson, our first and only match. We knew immediately when we read their profile that they were the family for us with so many similarities and common experiences. They were also amenable to an open adoptive relationship, which was very important to us. Once the legal agreements were signed to transfer ownership of the embryos to Dan and me, (because embryos are considered property in the eyes of the law), we moved on to the medical phase of the process. After being accepted as a patient at the clinic in Virginia where the embryos were created, we set a transfer date in March 2012. Following a very rigorous, 3-month cryo calendar packed full of a regimen of hormone injections and oral medications, bi-weekly blood work, tests, and ultrasounds, we flew to Virginia for our first embryo transfer. Needless to say, we were thrilled to find out two weeks later that I was pregnant. At age 46, I gave birth to our son, Trevor in December 2012 and at last, we were parents. Shortly after Trevor was born, we felt God’s direction to pursue another embryo transfer and made plans for the following July 2013. Again, we traveled to Virginia and found out two weeks later we were pregnant. Our hearts rejoiced being doubly-blessed by God when I gave birth to our daughter, Aubrey, in March 2014, just a couple of months shy of turning 48. God, in His sovereignty, not only prepared our hearts to receive potentially devastating and life-changing news, but He has taken us on a journey that has been nothing short of amazing and miraculous. Now, five years later, we are the proud parents of two beautiful children. Our son Trevor is 3 ½ years old and our daughter Aubrey is 2 years old, and we can see God actively involved with each step of our path to parenthood. My sister-in-law often jokes with us that, “We are the 21st century couple since we met online and then had our kids through embryo adoption.” While it has been unconventional for sure, there is no doubt that God has “made our steps firm” and orchestrated the forming of our family. 4word: How has God been evident in your adoption process? 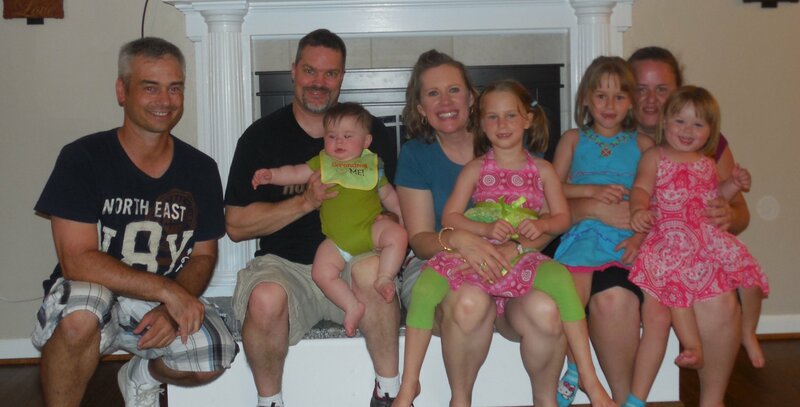 Kelli: God has been evident in every step of our journey to parenthood and beyond. From the outset, He prepared our hearts by leading us to embryo adoption the day before we were to receive the fateful infertility diagnosis. Instead of being caught off guard with a statement from the doctor saying, “Kelli’s eggs are no longer viable”, and not knowing what route to turn, we arrived to the appointment armed with questions and a peace that comes with already knowing our next step. Another milestone which demonstrated God’s leading in our journey was when we signed up with the Snowflakes Embryo Adoption Program through Nightlight Christian Adoptions. One of the criteria to being accepted into the program was that we needed to be married a minimum of three years. As God would orchestrate it, we had been married three years and two days on the day we turned in our application and deposit. This was also only two weeks after our fateful infertility diagnosis. 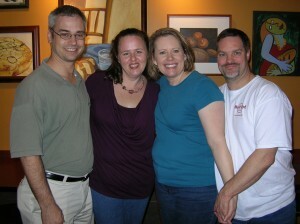 God’s providence is also apparent in how He brought us together with our donor family, Chris and Rebecca Henderson. From the very first time we met them—when sharing our infertility and faith stories—we recognized numerous similarities and parallel life experiences, but most importantly, a shared commitment to Christ. This was something we had hoped for and prayed for in a donor family. Again, we were reminded of God’s purposefulness as the four of us prayed together over the phone the night before our embryo transfer with Trevor. One of the most poignant reminders of God’s hand upon us was when Trevor was diagnosed in utero with water at the base of his brain, which could have resulted in miscarriage or severe birth defects. Dan and I remained steadfastly committed to God’s plan as we had to take a “wait and see” approach recommended by the doctor. In the midst of uncertainty of what this diagnosis would mean, we were on our knees before God when He reminded us that our little guy was actually His little guy. At the end of the pregnancy, we were reminded yet again of God’s faithfulness when our perinatologist (high-risk baby doctor) told us that the condition was gone. With that news we were thanking God, but were also completely bowled over when the doctor told us that this was only the fourth time in over twenty years of practicing medicine when he had seen this type of condition resolve itself. The path God is taking us on continues to unfold in our lives. He has used the pain, uncertainty, and joys we have experienced in ways we could have never imagined. It has been a consistent reminder of His goodness, provision, and faithfulness in our lives as we have shared our infertility and embryo adoption journey with others in a handful of interviews with national media outlets. Most recently, a very pregnant woman approached me at the baby shower of a friend. She explained how she and her husband had been praying about their family building options in light of their own infertility when they saw an interview we had done with our local news station. 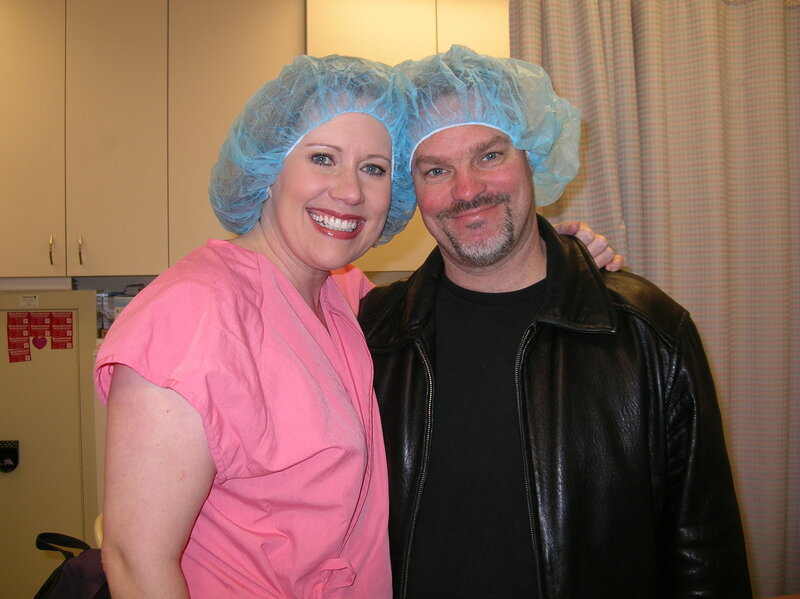 My heart leapt and tears welled up in my eyes as she shared that our story had led them on their own road to embryo adoption, and now she was only a couple weeks away from delivering her embryo adopted baby girl. As I left the baby shower, I thanked God for using our experience to encourage others and reminding me of his providential plan in our lives. 4word: What is your relationship like with the Hendersons (donor parents of your children)? 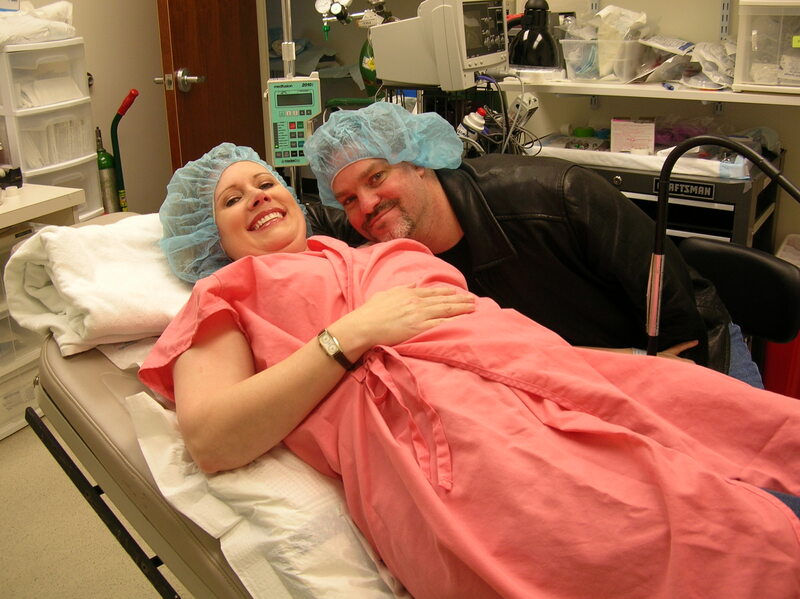 Kelli: Embryo donation and adoption relationships can vary in the degree of openness, with some families choosing anonymous donation while others opt for an open relationship like Dan and I have with our donor family, the Hendersons. Long before our kids were born, we felt that it was very important for Trevor and Aubrey to understand their unique birth story from an early age, which includes knowing their genetic parents, Chris and Rebecca, and three older sisters. We have been blessed with an amazing relationship with the Hendersons that started before our initial embryo transfer with emails and then dinner. The best way to describe how Dan and I felt before meeting Chris and Rebecca for dinner the first time was like going on a blind date with all the jitters and butterflies. But the nervousness was quickly allayed as we shared our infertility stories and how God had brought us to that point. 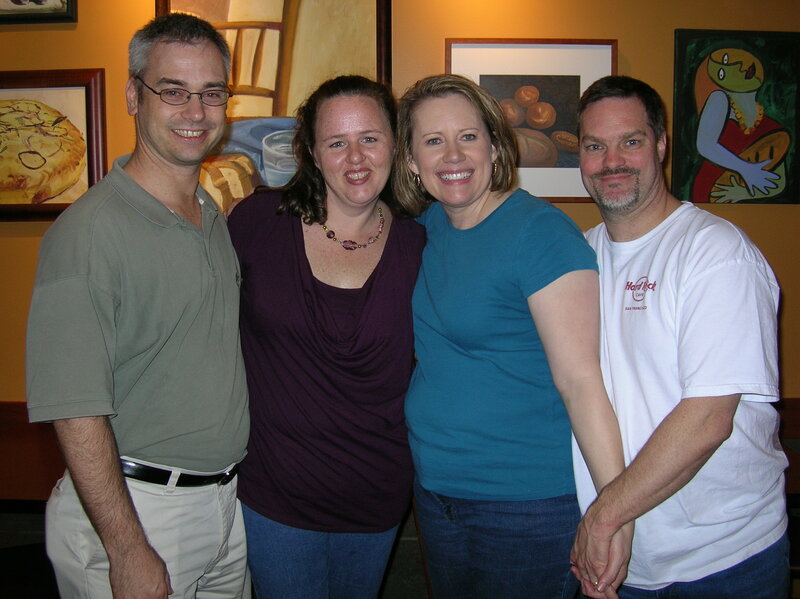 The four of us talked for hours (closing down the restaurant, and two other eatery/coffee shops) that night. It was very evident from that first meeting that God had very purposefully brought our families together. Since then, we have traveled back to Virginia Beach for our second embryo transfer, taking Trevor with us so that he could meet Chris, Rebecca, and the girls. While he was just a little guy and doesn’t remember meeting his sisters, it was so much fun seeing them interact and play with him. 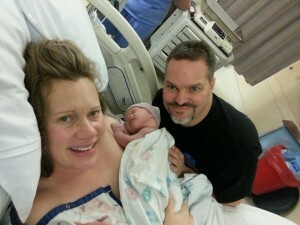 Chris and Rebecca have also traveled to Oregon, staying overnight with us and getting to meet Aubrey for the first time. In between visits, we keep in contact via phone calls, email, Facebook, and Skype. Recently, we all flew to see the Hendersons and spent a long weekend with them. That was the first time Aubrey met her sisters and the first time Trevor will remember meeting them. We were able to create many special memories together on this trip. 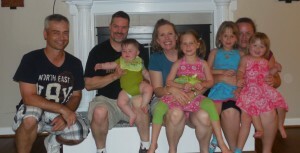 God has brought both of our families together in such a cool way! What a privilege it has been to be grafted into each other’s family trees! 4word: What is life like now after the adoption process? Kelli: Since leaving FedEx in 2008, I spent a year as a marketing consultant and eighteen months working as the communications manager for a large, $7 billion independent retirement living company. In 2011, I completely changed careers and became an assistant professor at Corban University, where I teach business and marketing classes in the Hoff School of Business. I relish investing in the lives of my students and seeing them turn theory into real-world experience working marketing projects for business and nonprofits in the community, as well as and launching successful careers. Additionally, being a professor has been a great job to have as a mom of little ones. While my work is fulfilling, my greatest role is being mom to Trevor and Aubrey. I love seeing them grow and learn. Loving and nurturing them to become who God has called them to be is by far my most important work now. Life is hectic when caring for two little ones under the age of three (while balancing the many responsibilities of wife, mother, and professor), but I wouldn’t trade it for anything! I thank God every day for His goodness, blessing, and provision. 4word: What advice do you have for other couples who are either looking into different family-building options or considering embryo adoption? Kelli: The first thing I would share with other couples is that there is hope even in hopeless situations and to remain open to God’s leading in their individual scenario. God has a way of bringing about His plan in our lives, which is so much more amazing than what we can fathom. I would also share about embryo adoption and how a woman can experience the joys of pregnancy. Not only is embryo adoption one of the most viable, cost-effective options in family-building, but it is also the perfect chance to bond in-utero with the baby while giving a full life to one of the 600,000 frozen embryos in the U.S. today. Additionally, many may fear the insecurity of traditional adoption, but with embryo adoption the law clearly determines that the parents of the baby would be the woman, who carries the pregnancy and gives birth to the baby, and her husband. Experiencing Pregnancy – It was very important to me to get to experience pregnancy if I could. While infertile, I still was healthy and could carry a child. Affordability – Embryo adoption was more affordable than egg donation or overseas adoption. In fact, it was the most cost-effective of all family building options, and we looked at the full gamut of them. Bonding In Utero ‐ We could bond in utero with the baby, which isn’t the case in adoption. This was priceless, especially when we held Trevor for the first time. Genetic Siblings ‐Knowing that we might want to have several children, it was important to us that our kids would be genetically related. We love seeing the similarities with Trevor and Aubrey, and even their Henderson sisters. Prenatal Care – Being health-conscious, I was very concerned about the prenatal care of our babies and wanted to give them the best possible start at life. Definitive Decision – Dan and I had a number of friends burned by traditional adoption when mothers changed their minds. With embryo adoption, we valued a clear transfer of ownership of the embryos. We wanted to pour our hearts into these precious little ones without the risk of them being taken away. Genetic History ‐ I lost my sister to genetic BRC 1 and 2 breast cancer. Given that, I liked knowing I would receive three generations of medical history as part of the donor matching process to help our little ones navigate any potential health issues. Open Adoption – As we considered embryo adoption, we knew it was very important for Trevor and Aubrey to know where they came from, who they looked like, and be able to foster relationships with their genetic family, as well as possible siblings in other families. 600,000 Embryos Frozen in U.S. – Dan and I believe life begins at conception and wanted to give these embryos a chance at a full life. To learn more about embryo adoption and donation, you can go to the Snowflakes Embryo Adoption Program website at https://www.nightlight.org/snowflakes-embryo-donation-adoption/ or search the web with #embryoadoption and #embryodonation. Hearing and seeing how God’s hand was in Kelli and Dan’s journey to becoming parents is nothing short of amazing. If you or someone you know is interested in pursuing embryo adoption, pass this interview series on to them and encourage them to start researching their options. Next week, we will wrap up our series by talking with the third member of this “snowflake family” and hear the story of her journey so far to becoming a mom. Kelli Gassman is an Assistant Professor of Business in the Hoff School of Business at Corban University, where she has taught a wide array of marketing classes the past five years. She was also an Adjunct Professor at the University of Memphis for four years. Her career has spanned 25 years in various roles including: Marketing Consultant, Communications Manager for a $7B independent retirement living company, and Global Marketing Advisor in the international division at FedEx. Kelli and her husband, Dan, have two children they call their snowflake babies. Trevor and Aubrey were adopted as embryos, and Kelli was able to carry both pregnancies and give birth to both of her children when she was 46 and almost 48 respectively. 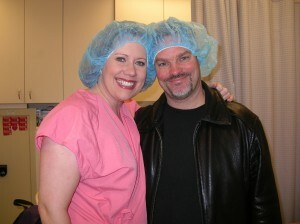 God has brought opportunities for both Kelli and Dan to share their embryo adoption story with a number of media outlets including: The Katie Couric Show, The Statesman Journal, KGW News, Sheknows.com, USA Today, Fox News, Fusion.net, Yahoo Health News, WVEC News and Redbook Magazine. Currently, Kelli is collaborating on a book about embryo donation and adoption with her kid’s genetic mom, Rebecca Henderson.